17 & Gone by Nova Ren Suma. Dutton Books, 2013. Currently Available. Face Value: Honestly, it looks like an instagram picture. It doesn’t make me not want to read the book, but nothing about the cover makes me totally ready to dive in either. Does it Break the Slate? This book starts as one thing and turns into another. And what it turns into, I think, is ultimately Slatebreaking. (could I be more vague? But I can’t spoil anything before the break at least). Women are victimized during this book, but there’s also a real dialogue about what it means that so many 17 year old girls are able to go missing without knowing what happens to them. Who would we give it to? Readers of contemporary realistic fiction, who are up for some darkness and ambiguity, with a fondness for an unreliable narrator. If you liked Suma’s earlier Imaginary Girls, you’ll like this one too – it walks the same line along the boundaries of reality. 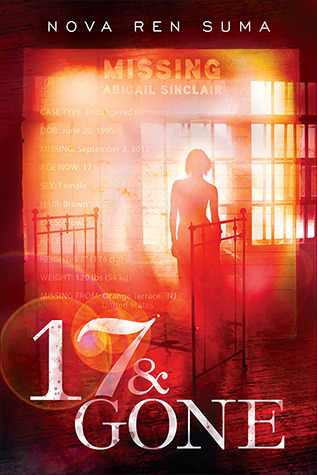 What happens is this: 17 year old Lauren is driving when she sees a missing poster for another 17 year old girl, Abigail Sinclair. And that’s the moment when she starts to have visions, visions of what happened to Abby before she disappeared and what might be happening to her now. And then the other missing girls start to push their way into her mind. All girls who disappeared at age 17. Lauren is 17. “The same number leaped out at me – 17, 17, 17 – pouncing and etching itself into my skin like a bloody needle in the midst of one of my mom’s more intricate tattoos. So from a feminist POV, I start to get anxious when I read a narrative that seems to be focused entirely on the way young girls can become victims, i.e. “disappear.” 17 year old girls, of course, are not inherently vulnerable by virtue of their age. But Suma takes real care here to paint the problem of disappearing girls as a problem not of the young women, but of the society around them. And then everything changes. But while the glimpses into these other missing girls were fascinating small character portraits, the mystery didn’t seem to be gaining traction. Lauren’s link to the world outside of the missing girls seems to be wearing thin. And then there is a moment where we realize – even though she’s our narrator, she’s the voice we’ve been listening to, and expecting to be “right” – she’s not. Things are not all right with her. As I continued reading, I started to realize that this was definitely not just a mystery ghost story, and it wasn’t going to end with Lauren defeating some dark and mysterious force – at least not the mysterious force we expected. In actuality, Lauren has schizophrenia and she is just beginning to show symptoms. What this book is actually about is her gradual slope into the disease. But because we’re hearing this story totally in her voice, it takes awhile for us to realize just how not okay she is. It also allows us to really and deeply empathize with her. By the end of the book, she’s not magically cured, but she is getting the help she needs. And she might be ok, but she isn’t there yet. It’s unsettling – deeply unsettling. There’s a horrifying scene where she wonders if her mother isn’t really her mother, that was (for me at least) the moment where I realized where things were going. But it’s actually one of the most profound and sympathetic portraits of mental illness I’ve seen in YA fiction, especially coming from the POV of someone experiencing mental illness. And this is what makes it a Slatebreaking novel. This entry was posted in Reviews, Young Adult and tagged mental illness, Mystery, Realism. Bookmark the permalink.